Below you may find general indications about how to get to our premises in Leganes, Madrid, as well as useful information related to Madrid public transport services. For detailed instructions about how to reach IMDEA Networks' offices (including those at UC3M) by car and by public transport, please download this PDF. 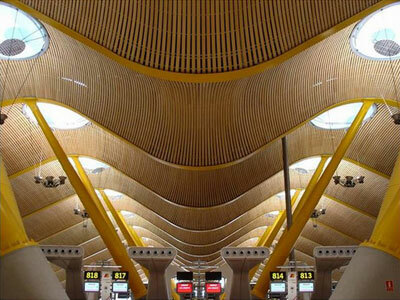 There are good public transport links between Leganes, Madrid Barajas Airport and Madrid city centre. The most convenient way to travel to and from the airport is by metro. When coming from the airport, heading to either Leganes or Madrid city centre, take Metro line 8 to Nuevos Ministerios. This is the final stop on line 8. From there you can take the train network (called Cercanias, in Spanish) directly to Atocha Renfe Station (all train lines link these two stations). From Atocha Renfe follow the directions below ("Between Leganes and Madrid city centre") for instructions on how to arrive at Leganes. Alternatively, you can use Nuevos Ministerios (or Atocha Renfe) as starting points to explore Madrid city centre by Metro. The "Cercanias" train network is the easiest way to travel from Madrid city centre to Leganes. From Atocha Renfe train station (which is connected to the Metro by line 1) take train line C-5, direction Fuenlabrada/Humanes, to Leganes Central station. The metro network also reaches this station. From here, it is a short walk to either the UC3M campus or the IMDEA Networks' main office. The latter can also be easily reached by metro stopping at San Nicasio station. Towards UC3M: As you leave the station, walk in the direction from which the train came (back towards Madrid, to the right of and parallel to the train tracks all the time). You will be walking along the street Calle de Santa Rosa. After a few minutes you will reach a roundabout with a monument to Sabatini. From here you can see the entrance to the main buildings of the UC3M Leganes campus straight in front of you. Towards IMDEA Networks's main office from Leganes Central Station: As you leave the station, take the right hand exit to Avenida del Cobre. Go left towards the parking exit, and then turn right. You will find yourself in Avenida del Cobre. Continue straight ahead onto Calle de Navarra. Cross the avenue to reach Calle Río Urbión. Go through a roundabout (you will still be walking along the street Calle Río Urbión). On the next roundabout, turn right towards Avenida del Mar Mediterráneo and follow on straight ahead until you reach building number 22. Towards IMDEA Networks's main office from San Nicasio Station: once you leave the station, go left towards the Av del Mar Mediterráneo exit. Follow on straight ahead and 6 min later you will arrive at Av del Mar Mediterraneo, 22. Up to date information on timetables and prices for Cercanías trains can be found on the official RENFE site and for the underground train system on Metromadrid site. Within Madrid the easiest way to get around is by Metro. In the city centre you will never be more than 10 minutes away from a Metro station and it is quick and reliable. (*) Minimum price of €1.5 up to 5 stations; €0.10 per additional station, up to a maximum of €2 for journeys of more than 9 stations. The Metrobus ticket is valid for 10 journeys either on MetroMadrid or EMT (buses), indistinctly, with which it is not necessary to have a different ticket for each form of transport. It is valid in all Metro stations within Zone A and all EMT stops, except for the Plaza de Colon-Airport route. Valid for one journey only between the stations of Line 12 and those of Puerta del Sur and Joaquin Vilumbrales on Line 10. The 10 MetroSur journeys ticket is valid for any journey within the MetroSur network, made up of Line 12 and Puerta del Sur and Joaquin Vilumbrales stations on Line 10. **Special Service rates for the Airport T1-T2-T3 and Airport T-4 stations. Passengers travelling with Transport Season Tickets (Zone A), Tourist Season Tickets and or AENA cards do not need to pay the special rate. Madrid has a large network of public buses.The “red” bus stops are easily spotted and each has a timetable attached to it. Buses operate daily from 06:00 to 23:30, depending on the line. From 23:30 to 05:00am special night services operate. Powered by Drupal and Drupal Theme created with Artisteer by Institute IMDEA Networks.